Included in every estimate is ATCO clear Shakelast Preservative. Although cedar is a naturally durable wood, it loses its protective chemicals and resins through weathering. This is evidenced by a shake turning gray and then black. 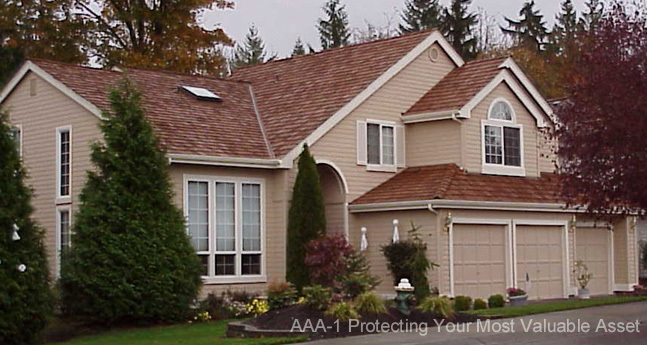 The roof is then vulnerable to attack by moss, mildews, fungus and insects. Water based ATCO Shakelast penetrates deeply into shakes carrying a copper naphthenate solution which prevents decay, moss, mildew and insect attack as well as controlling warping, swelling, shrinking, and end checking caused by changes in moisture content of the wood. Treatment is particularly important in areas where climate combines heat and humidity for portions of the year, on roofs of a low slope, and roofs beneath overhanging trees.